I don’t know how much head-scratching really went on for me during my 40 or so hours of play. “Ha! 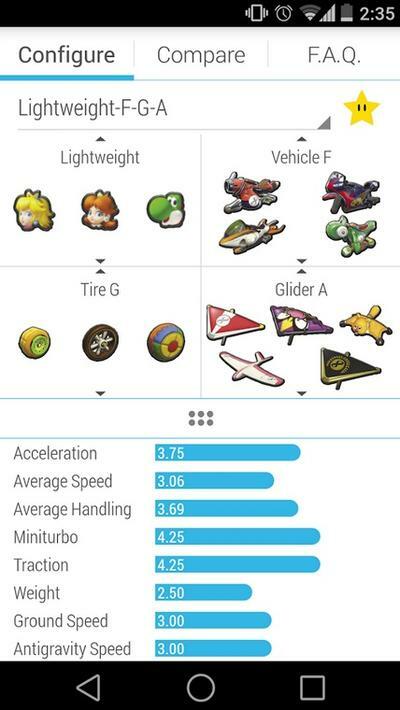 A gold kart with a flying squirrel glider? SOLD!” That’s pretty much how it went. Daily. Now, there’s a new companion app available for Android users that, as the description suggests, provides exact stats for every kart and character combination in the game. Of course, all of this information is readily available online to anyone with access to a site called Google. Maybe you’ve heard of it, whatever. The quality of Configure MK8, of course, lies in its convenience. There’s something nice about plopping down on your couch for a few rounds of racing with the ability to whip out your phone and pick the pitch-perfect racing combination with which to unravel your friends. The app is free, though it asks for support occasionally through donation buttons. While speaking with Kotaku, the developer said that he would create an iOS version if there was enough demand for it. I assume there will be. There is an official Mario Kart 8 companion app coming, supposedly. That one, though, will be centered around replaying and sharing video content from Mario Kart TV. It won’t help you beat your friends. Will you give this app a spin? You can nab it right here on the Play Store now.